Bill "Thunder" Thornton from Toledo, Ohio, was part of the substantial stable of talent Bob Devaney inherited from Bill Jennings when Devaney took over as coach in 1962. Thornton, a senior known as a bruising runner at both fullback and halfback, had already made a mark, having been named all-conference the previous season despite playing on a team that won only three games. He also had scored a key touchdown as a sophomore in the upset win at Oklahoma, a highlight of the Jennings era. When Devaney arrived and spurred the squad to new heights, Thornton was in the thick of it all. 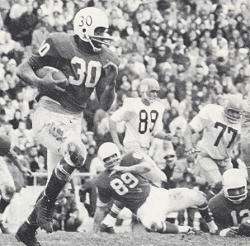 Thornton was a major factor in the 25-13 breakthrough victory at Michigan in 1962. He had suffered a shoulder dislocation but begged the new coach to let him play. He acted as a decoy on two Nebraska touchdowns and scored twice himself, including a 16-yard TD run that put the game out of reach. In his final game as a Husker, he scored the opening touchdown in the 1962 Gotham Bowl, and his run for a two-point conversion after Nebraska's final touchdown proved to be the difference in NU's 36-34 win over Miami. Thornton finished with 1,328 yards rushing, still good enough to rank in the top 40 on the school's career rushing charts. He was drafted in the fifth round by St. Louis and played for the Cardinals from 1963 to 1968. 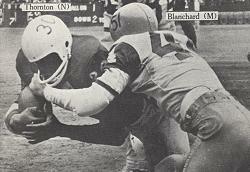 Turning upfield during a 1962 game. touchdown in the 1962 Gotham Bowl.